» Measuring Ultrasonic Piezo Transducer's Resonant Frequency? Measuring Ultrasonic Piezo Transducer's Resonant Frequency? I thought I might do a project or two (for fun) with an ultrasound transducer. I have several to work with, but don't have a data sheet. I thought I'd measure their Resonant Frequency to help with the rest of the design. The one (web) image shows a "typical" piezo ultrasonic transducer's impedance vs frequency, with a nice dip in the impedance at its resonant frequency. I didn't get the results I thought I would get, and thought I'd seek some input from others. Its just been too long since I did much work with complex loads and j-omega this that and the other. I was under the impression that a piezo ultrasonic transducer had a primary resonant frequency, and that its impedance was minimal at its resonant frequency. I thought that if I swept the input frequency I could simply measure the transducer current and find the frequency at which the current peaked. (I=V/R, ought to get a maximal current at a minimal resistance (impedance)). Easy. I put a 10 ohm resistor in series with the transducer and feed the signal across it to an op-amp difference amp, to measure the signal across the resistor. This is the transducer's current monitor. So I fired up a sine wave to an op-amp driver for the transducer, and also fed an inverted sine wave to the transducer's other terminal. With the two Sine wave signals there is no DC bias across the piezo. Sweep the frequency and there is a clear current peak at about 60 KHz. Cool. So its a 60 kHz transducer. Next I add a (wide band) signal receiver, and watch the output of the receiver as I sweep the transmitter. There is a very clear received signal peak at about 25 KHz. So, it must be a 25 KHz transducer. Clearly the transmitting and receiving transducers put out a large amplitude signal at 25 KHz. So, why don't the two match, or even come close? Even if the 60 KHz current peak was either a secondary resonant frequency, or a harmonic of a lower resonant frequency, why isn't there a current peak at 25 KHz? The rather noisy scope image shows two signals as a function of the sweep frequency. The horizontal axis corresponds to the transducer's drive frequency, which sweeps from 5 KHz to 65 KHz. The Top Center marker with a "T" is the scope's trigger point, and is at 25 KHz. The top, blue, trace is the ultrasonic transducer receiver's signal. There is clearly a peak at about 25 KHz, plus or minus a couple of kHz. There is a small signal "peak" at about 60 KHz. A little bit stronger than the rest of the sweep, but nowhere near as strong as at 25 KHz. The 3 spikes just below the 5 KHz label are actually the 60 KHz mini-peak, just before the sweep starts again at 5 KHz. The lower, yellow, trace is the current monitor for the transmitting transducer. It shows a clear peak at about 60 KHz. The current actually appears to slightly increase as the sweep frequency increases, and then has a nice peak at 60 KHz. 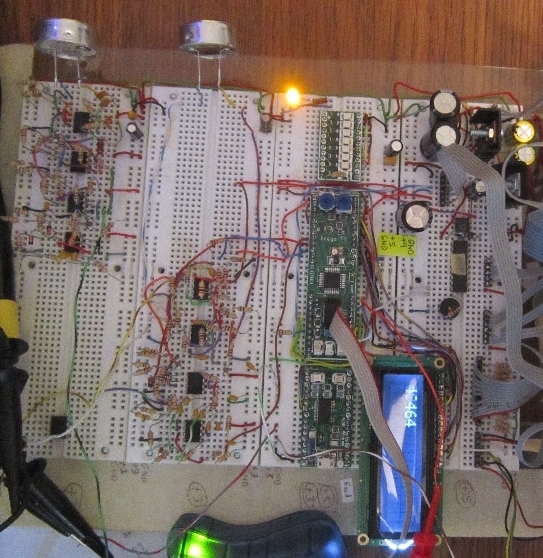 The traces are very noisy, the circuit is laid out on a bread board, and the scope leads are long... But the findings seem consistent. Clearly, my original concept of measuring the piezo's current, by monitoring the voltage across a small series sense resistor, and using that as a indicator for the piezo's resonant frequency isn't working as expected. Could be VERY wrong, but I suspect that you are dealing with series and parallel resonances., OR, multiple modal resonances. Though, with a resonator that is a series LC shunted by an additional capacitor, the low impedance is at a lower frequency than the parallel high impedance resonance. I appreciate your taking a look and sharing your thoughts. Some time ago I worked with a 200w ultrasonic transducer, measuring both current and phase angle to deduce the resonate frequency. I've thought about clipping the current signal to then do a phase comparison of the current vs the driving voltage, but then I also thought about just getting on with the primary project, at 25 KHz. I'm still not sure why I didn't see a current peak at 25 KHz, but I'll have to give it some more thought. Thanks for the link to your project. Just another 2cents worth ... as a communication link you are more interested in what frequency produces the most radiated power. For example a quartz crystal will show the same impedance versus response as your transducer but they do not actually radiate the signal. Well, not intentionally. Using two similar transducers put your 'scope on the RX end and sweep the frequency going into the TX end. Also, you could do some rough radiation pattern measurements this way. I think I am doing essentially what you suggested, except I'm looking at the receiver's output after its been amplified. That's the upper, blue trace, above. It has a definite peak at 25 KHz. Interesting you mentioned the radiation pattern. I know there is a pretty good side lobe, as I can block it by putting a piece of cardboard between the two transducers. It definitely impacts the near field measurements when using it for simple range measurements. Maybe, move the transducers apart ... say several metres. Could you post the schematics of both the TX and RX? A few comments are probably in order. I had TLV2772 op-amps available on the bench, Rail-to-Rail, 5 MHz UGBW, but only 5 V Vcc Max. I therefore used them to filter the DDS generated sine wave and feed the AD826 op-amps, which I also had on the bench. These have V+ = +/-15V, 50 mA Iout, 50 MHz UGBW, but are NOT Rail-to-Rail. I think this op-amp also likes a rather low Rf resistor. It clips at about 1.5 V from the rails. 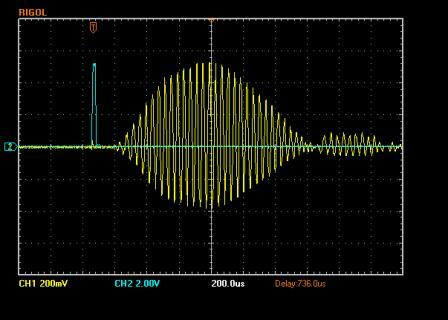 The driver, therefore, AC couples the sine wave into the AD826, which runs on Vcc=9V. (With a 9V wall wart and a reverse polarity protection diode it more like 8.x volts, so Vsignal max is about 6.5 V before the AD826 clips. The transducer's current sense resistor feeds a difference amp, which then feeds a "perfect diode" peak detector / envelope detector. The second diode on the detector just keeps the op-amp from going into saturation on the other half signals. (It isn't a full wave rectifier). I'm using an Xmega32E5, and the ADC doesn't have Vcc as an internal ADC reference. (That surprised me). Hence the output of the envelope detector has an attenuator to feed the ADC using the Vcc/1.6 ADC internal reference. This attenuator also acts as the "bleed resistor" for the peak detector / envelope detector. The little 22 ohm resistors feeding the AC couplers are because the TLV's don't like driving highly capacitive loads without them. In theory, one might expect to feed the Xmega's DAC directly into the LPF. Unfortunately, presently, I have the DAC going within a couple of counts of full scale, and the lower end still clipped on the almost Rail-to-Rail TLV. Hence I simple attenuated the DAC output, now 0 - 1.5 V PP, and AC coupled it into the LPF. I had hoped to use the transducer current detector as a simple means of determining the transducer's primary resonant frequency. Unfortunately, thus far that has failed miserably. Conceptually I thought it would work, but it just hasn't panned out, at least for the transducers I'm working with, and my approach at measuring it. This is a real work in progress. It started out as a broad band receiver so I could do some initial testing with 20/40/60 KHz transducers. Hence no BPF's in the received signal chain, (yet). I'm still experimenting with the receiver's gain. Occasionally adding or removing a stage, or tweaking the individual stage's gains. I intend to add a simple uC controlled attenuator in the middle of the signal chain, so that the micro can increase the gain over time, to account for a weaker returned Ping echo with greater distances. A sawtooth ramp and a voltage controlled amp would be the optimal way to do this, but I'm just playing with it, and envision three gains, (100 %, 50 %, 32 %). This receiver is wide band, 5KHz to 100KHz. Once I quit playing around sweeping the transducers I'll switch to a BPF centered on the resonant frequency. The HPF stage comes first, as it intrinsically AC couples the piezo transducer. The Driver needed a few AC coupling stages to keep the signal centered about the virtual ground from the DAC to the 3V op-amps and again to the 9V op-amps. The receiver's entire signal chain is run at 3.3 V. The AC coupling is just to remove any DC offset one accumulates from stage to stage. I had originally hoped to do a direct signal detection with the Xmega's ADC, (without the envelope detector), but given my minimally proficient programming skills, it will fall short of the required sampling rate and processing time to track the Ping's individual period peaks at the start and end of the Ping. Oh well, save that one for another day. Hence the envelope detector, and once again the XmegaE's ADC attenuator. I can get about an additional volt out of the input signal to the ADC if I switch to an external voltage reference, but I've not done that yet. So many other aspects of this project are still being investigated. I'm sure (retrospectively! ), that using the "right" op-amp would have made the driver circuit much simpler. But I wanted to experiment with what I had on hand, and not wait for a Mouser order. I appreciate everyone's interest, and any further insights into using the current monitor as the resonance detector, instead of switching to a voltage vs Current phase approach, (or ignoring it altogether!). OK, just had a look to see if there was anything obvious in your filtering strategy. We used a network analyser to look at quartz crystals, say in the 10-30MHz range. Maybe, search around for hobby implementations of low-frequency network analysers. Or borrow something. Still I don't have any idea of at what frequency you get maximum radiation. I have done a bit of work with PZT devices, they are not typically linear, in a bipolar fashion. They typically limited to 25 percent reverse polarity. Not sure about your particular transducers. they are not typically linear, in a bipolar fashion. I wasn't aware of that, thanks for the insight. I'm working with small transducers, < 200 mW, not the more powerful ones used for cleaning, or sonar. The ones I have do have a polarized marking on the two leads, but I thought the + was to indicate the "polarity" of the sound pressure wave, with an applied voltage across the piezo. Looks like I've got some more learning to do. I have worked with larger stacks for motion control with flexures. In reverse polarity the contraction rate, is greater, so it might overdrive the PZT. This could result in undesired behavior, much like hitting a stop. They can easily be driven into destruction. Strain sensors are often used to examine behavior. While a PZT drives much like a capacitor, they exhibit hysteresis and other errors in travel when examining by voltage characteristics. We use 25/40 KHz transducers in a speed of sound measurement instrument, though they differ in size, the 25KHz ones are larger, that may not be the case with other brands of transducers. One way we have used to measure the resonance is pulse the ducer and then watch it vibrate, it will ring at or near it's resonance. I like that. Just like hitting a bell with a small hammer. A short pulse, like a dirac delta function, then observe voltage at PZT. Great idea. I have worked with these xducers a little. I determined resonance pretty much like jccordill suggests. Hit it with a narrow tristate drive pulse and watch the resultant ringing on the O-scope. It may be that in your original experiment you were measuring an electrical resonance point but not the primary mechanical resonance point because you weren't driving it hard enough to induce any significant mechanical movement. Bear in mind that in these devices the resonance is caused by the symmetrical nature of the piezo element - i.e. it produces electrical energy from mechanical deflection and conversely mechanical deflection from electrical stimulation - in sympathy with the mechanical properties of the disk - mass, elasticity and shape. A rough analogy could be made with a DC permanent magnet motor. There is a time constant associated with the armature - apply a voltage to the motor and it reaches 2/3's of its final speed in "T" seconds. But there is also an electrical time constant associated with the armature's inductance and interwinding capacitance. The two are quite different in magnitiude and frequency. I appreciate the further comments. Pinging the transducer and then measuring the response looks like an interesting alternative method to measure the resonance. I'll have to give it some more thought. I was also thinking of feeding the voltage and the current signals into a high gain op-amp stage to clip them into square waves, and then measure the phase difference between them. Lots of references note that at resonance the piezo appears purely resistive, and the voltage and current are in phase together, with no phase difference between them. I was thinking of using the XmegaE's logic gate module to generate a phase signal from the two square waves, and then feed that into an input capture pin to let a timer/counter measure the phase difference. I'll have to look at both approaches and do some experimenting.